Who wants a fixer upper? I was thinking Kevin, but if anyone else is interested, please let me know. This violin sounded great before it was stabbed by a forklift on it's way to the NAMM show. Aw, the poor violin! I'd love to learn how to repair stuff someday, but maybe not learn on something so challenging, lol. Wow, what bad luck. I'm assuming it would need a new back piece? or could those pieces be repaired? it's be an interesting project but i wouldn't even know where to start. Can't wait to get into this one. I see the sound post was pushed through but I have fix worse. I wonder if the bass bar is broken, I imagine it is. Now that the nerves in my hand have been fixed I can't wait to get back to playing or should I say screeching. The instrument is on it's way to Kevin. OldOgre, I'm sorry but Kevin actually called us right after I made the post. I should have gone in here and said something. Just my luck, always a day late and a dollar short.. Good Luck with it Kevin, should keep you busy awhile. So, I have to ask: at what point would you consider a damaged violin "totaled" and irreparable? 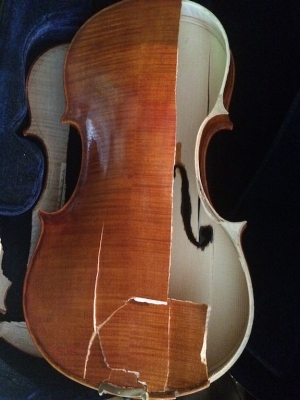 I was wondering the same thing as KindaScratchy, because I couldn't even imagine where to start fixing a violin that damaged. 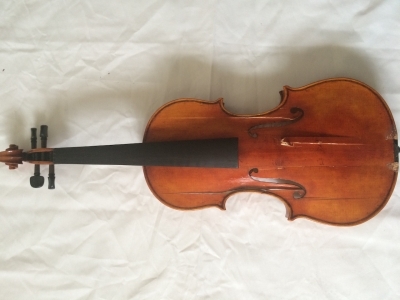 My plan to learn some minor repairs is to try and win a an auction on a cheap vintage/antique violin on ebay that needs minor work done and tinker around with it. most people would consider that a total and unrepairable. And it will never sound as good as it did. But for someone like Kevin or others it becomes a learning tool for repairing other instruments. So its not will it be as good as new, its can I even get it back to good. I thought I posted this yesterday, but maybe I forgot to hit the submit tab. @Pierre, I thought you had a couple "luthiers" working for you or are they just set-up guys and not qualified or skilled to repair the instrument. Anyone in doubt, I've watched my luthier, "Mark Schwartz" repair violins, violas, cello's and double bass' and they looked and sounded great. So if all the pieces are there, it can be repaired, good as new. 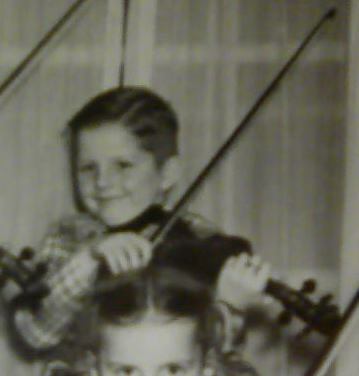 fiddlestix - waving at you... been thinking of you. @Kevin M. I am excited to hear that you might be healing enough to play. Nice to see you. Good luck on this project. After coming home today there was a box at my door. The violin came and it is a mess but it hasn't been mess with so the pieces fit together very well. As I though the worst of the damage is the hole where the sound post came through. That too is repairable. 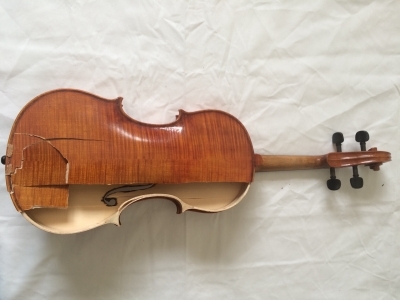 I must say this is a very well made violin. As I start taking it apart I will take pictures and explain how and why I am doing something to the piece. I can see this being a wonderful instrument again. 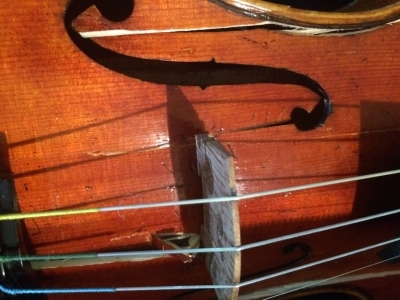 To answer some questions of when does an instrument become unrepairable. That is all up to the owner and if they want to pay a luthier more than the violin was originally worth but then worth becomes a personal thing as a violin is part of us. Thank you. My hand will never be what it was but I want to play again no mater how well I can. I am the only person I have to please with my playing. We have two luthiers but selling a repaired violin like that is not so easy. How much of a discount should we give? How many hours will our luthier put in? It was a fantastic sounding instrument Kevin. And yes, this is nothing compared to some instruments that I have seen. The glue that is used to piece the back and top together is stronger than the wood itself. 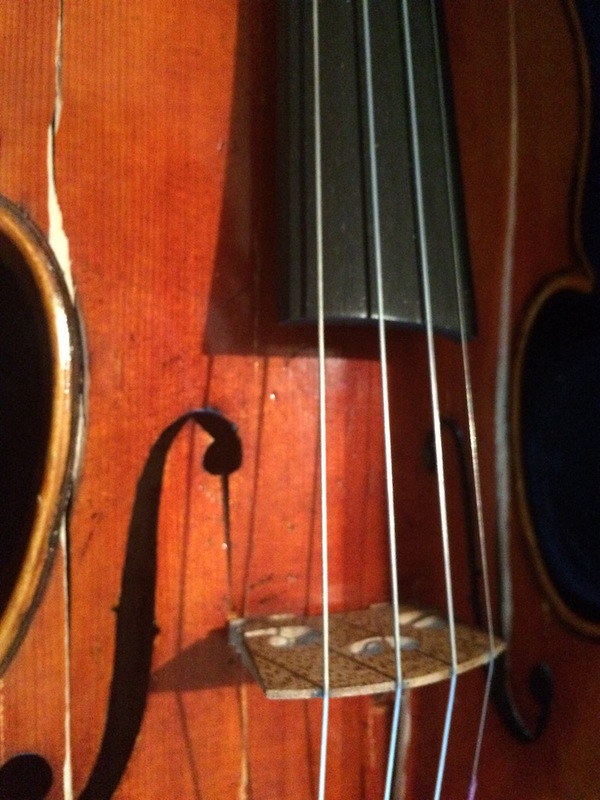 If held together properly while drying, this violin will never break or crack at those spots. As Kevin said, the worse part is the area where the sound-post sits.